Have you ever noticed that you can buy/purchase pretty much anything you want? In the new age of internet, anything your heart desires is simply a mouse click away, those buying can do so on whim and/impulse, and those selling simply wait for the bank transfer of funds and the item is shipped. This is also true in the world of animals. You can pre order a puppy/kitten and parrot eggs. Sight unseen, you pay your money and just like magic, that new living creature is shipped off in a crate and arrives at your nearest airport. This is also true of online venues such as kijiji/used online sights, and more pet sites are also popping up. As a rule I tend to stay away from the sites as they truly depress me – the continuing ads of selling and/or giving away family pets because someone developed allergies – someone is moving – someone discovered that they really don’t have the time – others who simply purchase animals cheaply or for free and then turn around to sell them – to make money. And of course theres always those looking for free pets because they simply want one without paying the cost. 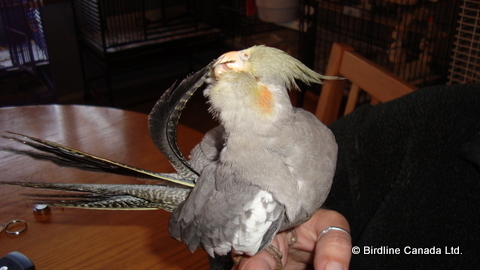 The story of this special cockatiel is from such an ad. 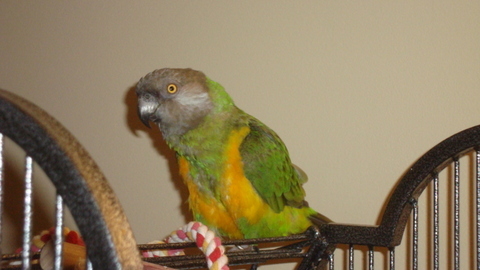 I happened to be an online for sale venue looking for a cage and an add caught my eye “PLEASE HELP ME! !” I got this bird and it hasn’t eaten in days and there’s something wrong with it and I have no money and my parents will kill me. It intrigued me for a number of reasons so I emailed the ad asking what was wrong. 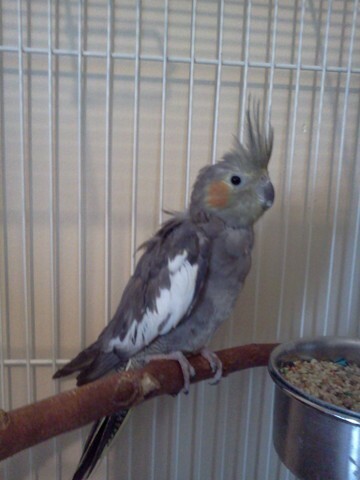 I was then told by a young 16 yr old girl that she got a baby cockatiel from a breeder – the breeder met her in a parking lot and gave her this bird as the other birds were beating it up and she didn’t want it – so she carried it home and hid it in her bedroom. After 2 days of not eating anything but a tiny piece of millet, she placed the ad. She refused to allow me to come to her home and pick the bird up and asked me to meet her in a parking lot. Against my better judgment, I said ok. We set up a time to meet her and there I waited. The young girl came walking through a field, carrying a small round cage with a bird inside of it. I immediately took the bird, put it in my car and then the MOM in me came out full force. I asked her what the hell she is doing meeting strangers in parking lots, does she not realize the sheer DANGER of doing this?? She claimed she loves animals but her parents do not and forbid her to have any, so she meets people in odd places, gets there free pets (birds/rodents) and trys to help them – than sells them. After a long lecture and a promise she would stop this behavior – not only for her safety, but the safety and health of unknown animals she’s bringing into her home, we parted ways. We immediately saw that there were issues with this little cockatiel, she was very young – maybe 2 months old. Incredibly thin and open scabs all over her back – and her eyes were very misshapen and swollen shut – or so it appeared. We got her out of that horrible cage (round cages should be abolished!! )and settled into a smaller square cage. It became apparent immediately that she could not see or judge where she was. We outfitted with the cage with a ton of perches, flat surfaces and placed her food/water directly in front of her. Once she realized the food was there, she dove in; this little girl was soooo hungry. As I sat watching her, my heart was heavy once again – another victim of an uncaring breeder, once again, all about profit or lack thereof in her case. No value was placed on her, just another disposable bird. Her resilience to survive gave her the name of “Hope”. Once we made it to the vet with her, it was then we discovered she was indeed blind – she did not even have the orbits for eyes – she was born without them. It’s clear the other birds and probably her parents knew she was “defective” and that is where the bites on her back/neck came from, it’s not uncommon for parents to kill their young babies when they determine they are not healthy. She was placed on pain meds and antibiotics for infection and we monitored her weight to ensure she was eating and gaining weight. Over the course of the weeks following, we continued to work with her in various ways to teach her how to be a bird with no sight. 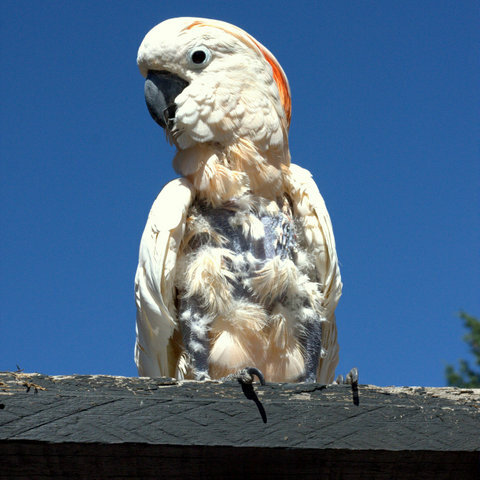 She learned how to walk to the edge of her cage without falling off – she used her beak to guide her and when she noticed the edge was gone, she stopped. She learned how to climb up her boing and back down again, all by touch and would spend hours going up and down, chirping and singing the whole time. She loved to hear herself in her food bowl, she would start singing and chirping and being so incredibly cute while her head was buried in her seed bowl. She didn’t know she was different, and she didn’t really care. She only flew a few times, and obviously it wasn’t in her best interest as she couldn’t navigate so she was lightly clipped to prevent any dangerous crashes. People who met her were in awe of her abilities and the fact she truly seemed so happy all the time. She continued to thrive and the scars healed and she was ready for her next journey. She was adopted into an amazing family and continued to be an amazing girl (later we found out after her first molt she was a boy) who loved her for many months. Sadly, a tragic accident claimed her life. I will never forget the day we got the call she was flying free – the tears flowed so heavily at her loss. But I was also incredibly thankful. Even though her time with us was short, she made every single minute of it count. She showed us all how it’s okay to be different, and that being different does not mean you can’t still enjoy life. Every life has value and meaning….but we’ve become a throwaway society…if we don’t like it, toss it, if we don’t want it, give it away, and in the case of Hope – she had no monetary value so give her away and let her become someone else’s problem – but the opposite happened – she became a treasure – loved – wanted and irreplaceable…forever in our hearts….